This morning, I got a text from Lisa Keeler telling me that her SOL post was about me. She and I met through the world of blogging and specifically, could trace the genesis of our real-life-meeting path to the community within the SOL. Her post this morning welled me right up. We don't often get to know the impression we make on other people--I frequently wonder how crazy my life appears to visitors and observers--and we almost never get to read about it. Lisa's post this morning was a gift I will treasure. I could go on about how much I also have enjoyed getting to know Lisa. I could write about the dinner we made together in her Virginia kitchen that we ate in Adirondack chairs overlooking meadows, pastures, and beautiful horses. I could also write about the amazing adventures she had as a child traveling around the world, or I could write about the angel food cake she made today for her mother's birthday because it's her mother's favorite. I could write more, too. But here's the thing. It's really hard for people to understand that relationships really do come out of blogging and twitter and the SOL community until they experience it. When I told my daughters about my new friend Lisa who I only knew through shared posts, on-line stalking, and a phone conversation, they thought I was crazy. Okay, so she has daughters who remind me of my own, a mother with the same birthday, a lab who was older than mine (and took as many pills as mine does until hers died a few months ago), plays tennis, has a similar job, and...I could go on. When we met in person and my daughters met her in person, they understood. "You really are a lot alike," one of my girls said. "That's weird." Maybe it has something to do with the fact that all of us in the SOL community commit to noticing moments and appreciating them enough to write about them. Generally, the moments we share are not shared with the intention to complain or criticize, but rather to celebrate and relive a wonder (my OLW for 2016). 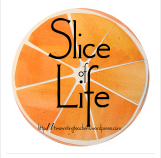 Thank you to all of my slicing community, thank you Stacey for bringing so many people together, and thank you Lisa. My world is richer because of the connections I've made through sharing bits of life every week. I know some just don't get the connection created through words, but when you write and read the connection grows. What an awesome connection you have made with Lisa! What a gift we've both gotten. This is what I said to my mom as we drove home from our afternoon with you" "If my life hadn't taken a huge hard left turn a few years ago, there are so many good things I would have missed." I started to list all those things and people and moments and you were among them. What a wonderful gift you've both received and how fitting that you've both expressed your deep gratitude for that gift in writing. This writing community really is a gift that reaches beyond the borders of the screen! "Writing is a powerful connector." This is a profound truth, Melanie, and I am profoundly grateful that writing has connected us. What an encouraging post! Really enjoyed reading about you and your friend, Lisa! I agree, this really is a special writing community! I have only met a few people from this group in person, but it is super exciting to put a face to a name. Who would have thought that a virtual community could be so sustaining. I couldn't agree more. I have such deep and rich relationships with the people in my blogging community. It's a place where I know I can count on people to understand what I'm talking about and why it matters. It delights me to no end to know that you and Lisa have been hanging out together! Just think of how much extra fun you'll have every time you visit Julia down at school now that you know each other. Such a beautiful statement about why we write:"the moments we share are ... to celebrate and relive a wonder." And I think it's just grand that out of our writing we can become friends with people we only know "through shared posts, on-line stalking, and [maybe] a phone conversation." Thanks to you and Lisa for sharing! I read Lisa's post and now yours and I get it completely. The friends I have made through this community are near and dear to me.